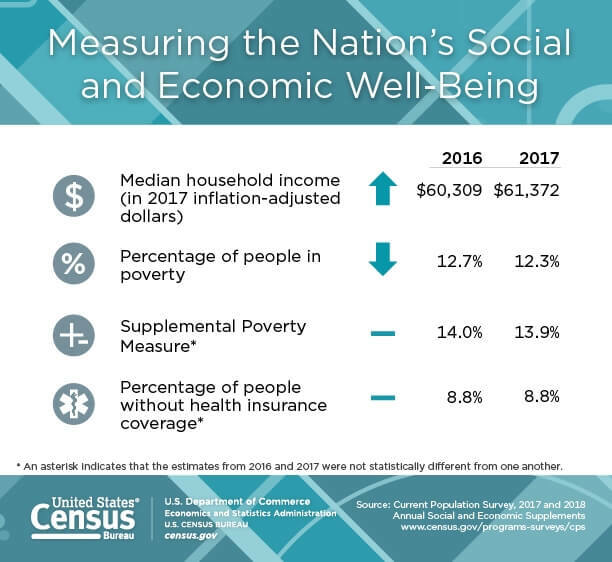 Yesterday, the U.S. Census Bureau released its latest data on income, earnings, income inequality, and Poverty. The report finds that median household income increased by 1.8 percent in the past year, while the official poverty rate has dropped 0.4 percentage points, from 12.7 to 12.3 percent. However, the Supplemental Poverty Measure (SPM) — which factors in tax credits, government assistance programs, and expenses — indicates no statistical difference in the amount of Americans living in poverty from 2016 to 2017, nearly half of which are living below 50 percent of the poverty threshold, otherwise known as “deep poverty.” Moreover, the poverty rate among African-Americans and Hispanics both remain above 20 percent, far exceeding the 9.8 percent poverty rate for whites. The report also finds that 2.4 million Americans worked full time all year and lived in poverty, which is not statistically different from 2017. A factor to consider here is that in the past 40 years, real median hourly wages have remained stagnant. In fact, from 1976 to 2016, real wages for the bottom quintile have shrunk by 1 percent. Meanwhile, the number of Americans without health insurance remained the same at 8.8 percent. It’s the first time in years that the number of uninsured Americans did not significantly decrease. Some experts suggest that the stagnation in health coverage may in part reflect recent efforts to undermine the implementation of the Affordable Care Act. Other Census data show that refundable tax credits such as the Earned Income Tax Credit (EITC) and the Child Tax Credit (CTC) lifted 8.3 million Americans out of poverty in 2017, SNAP (food stamps) lifted 3.4 million, the Supplemental Security Income (SSI) program lifted 3.2 million, and rental assistance lifted 2.9 million. Click here to read the U.S. Census Bureau’s press release. And visit the Income and Poverty page for more reports and links to applicable data. State and community level data from the American Community Survey can be accessed using the American FactFinder. The Coalition on Human Needs has helpful information on how to locate data on the Census website and will be cataloging analyses from other national anti-poverty organizations on their 2017 Census and Poverty Data page.